Content: 80 ml / 3.7 FL. OZ. Sleeping pack that gives intensive hydration, vitality and brightening effect during sleep. Laneige Water Sleeping Pack_EX comes in jar packaging with blue color, which a little bit heavy in my opinion although it's made from plastic (thick one, of course). The box comes with white color with blue accents. Minimalist enough, I think (Laneige products always have minimalist design but with an elegant feel, as far as I know). The blue color itself represents the product which is related to "water" and moisture. The jar is tightly sealed when purchased. 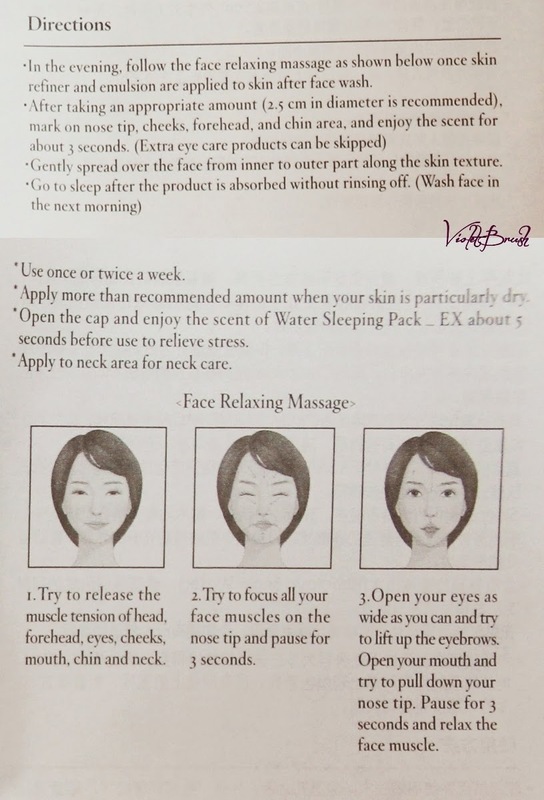 Laneige Water Sleeping Pack_EX also comes with "Special Care" pamphlet which explains the product. Although it comes with jar packaging, no need to worry about the product's hygiene since Laneige provides a spatula inside to scoop the product in appropriate amount. Apply in the evening and follow the face relaxing massage shown on the picture after face wash, refiner and emulsion application. Take an appropriate amount (approx. 2,5cm in diameter), mark on the nose tip, cheeks, forehead, and chin area. Enjoy the scent for 3 seconds. Go to sleep after the product is absorbed. Rinse off the next morning. The texture is creamy-gel-like. It's soft and quite watery. When applied, it feels sticky for a while and afterwards, it feels soft. Laneige Water Sleeping Pack_EX also absorbs quickly. For me, the scent is quite nice. I don't know how to describe it but the scent is very relaxing. Maximize the efficiency of overnight water supply. Deeply hydrates fatigue and dry skin, strengthens the skin barrier. Brings crystal-clear and even skin tone by removing harmful oxygen and by purifying skin. Removes dead skin cells for vigorous water supply and sleek skin texture. The aromatic essence compound helps relax the mind and body to promote good sleep that eventually strengthens skin revitalization. Helps the skin to look more crystal-clear vitalized. I could say that I really love this product. When I applied this at night, there would be no traces of dry skin in the next morning. This product helps to return my skin's moisture over the night. The morning after usage, I could feel that my skin is softer and firmer. The scent also helps me to relax. Like what Laneige claims, the product doesn't make my skin feels sticky. I have used this product for about a month (twice a week) and I could say that Laneige Water Sleeping Pack_EX doesn't cause breakouts. Although it's quite expensive, you don't need much product per usage so that makes this product not that expensive as it seems. People often questioned the hygiene of a product with jar packaging, Laneige has thought about it beforehand by providing a spatula thus making the product's hygiene assured. Update (21/11/2014): this product also helps to reduce the redness of acne and acne scars. You can find this product on Laneige counter inside Sogo, Metro or Matahari Department Store (or another department stores).